Back on the market!!! This 2-story move-in ready condo located in Creek Village features 2 bedrooms, 2 bathrooms, and an open floor plan which is perfect for entertaining. This home has been recently painted throughout, has duel paned windows which provides a lot of natural light, plantation shutters, textured high ceilings with recessed lighting, base and crown moldings, and central A/C & heat. The kitchen features plenty of storage, a pantry, a lot of counter space, and an eating counter that leads you Back on the market!!! This 2-story move-in ready condo located in Creek Village features 2 bedrooms, 2 bathrooms, and an open floor plan which is perfect for entertaining. This home has been recently painted throughout, has duel paned windows which provides a lot of natural light, plantation shutters, textured high ceilings with recessed lighting, base and crown moldings, and central A/C & heat. The kitchen features plenty of storage, a pantry, a lot of counter space, and an eating counter that leads you to the dining area. The living room features a cozy fireplace and provides you with access to the beautiful outdoor patio. Both bedrooms are located upstairs, have high ceilings, walk-in closets, and beautiful ceiling fans. The very spacious master also includes a large wall-to-wall mirrored closet. The Jack & Jill bathroom leads to the second bedroom. 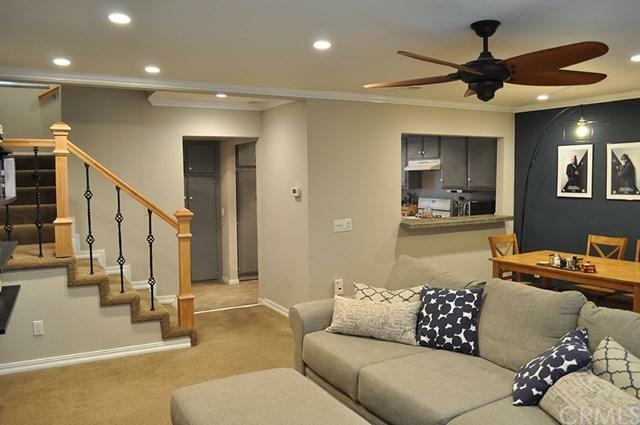 Oversized 2-car garage in basement which has laundry hook ups (washer/dryer included). This unit is located in a clean and quiet community that has an association pool, spa, and tennis courts. Close to shopping, restaurants, and movie theatre. Definitely a must-see! Listing provided courtesy of Nationwide Real Estate Execs. Listing information © 2019 San Diego MLS, Inc.